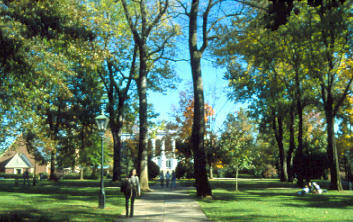 Hollins is a great school for just about any major, especially those in the humanities or social sciences. All the faculty members are so nice and helpful. I have one professor who is not my advisor, but is willing to sit down with me and chat about problems with a class or life. Also, all the professors I have had are highly educated, published, and have their own websites. Some even have their own wikipedia page! Those things are the mark of quality teachers. The student body is also very diverse and accepting. You can feel free to express yourself through unique dress without being ostracized, for example. People are friendly and willing to help if you need help. There is a strong sense of community here without being mindless school worship. We are proud of our college, but keep it in perspective. Also, fun fact: we have no mascot! Academics are a top priority here instead of sports. That is not to say there aren't good opportunities of you are interested in that. The equestrian program, for example, is highly celebrated and boasts many members. It is a little bit expensive if you are just interested in taking lessons for fun. I'm sad that my time here is almost up because Hollins is a great school!